Inspired by my recent gradual weight loss I found myself looking through the rack of end of season swimwear at our local Trade Secrets. A red one piece caught my eye. It was made by a famous "hold-in-your-tummy-undies" company. The price tag was an original $160 but was slashed to just under $20. I couldn't resist trying it on. Please don't get excited. This is not me wearing the swimmers but a photo I found on Google. I admit that the pair I found was (at least) one size smaller than I consider myself to be. Had there been a larger size I most likely would have gone with that one. Being as how this was the only pair left I wriggled and jiggled and squueeeezed and contorted my way in to it. As the swimmers fell into place I gasped. The Gina I saw reflected back at me looked like she had had mega surgery. Bye bye tummy, hello waist! Granted I could hardly breathe and eating would be out of the question but hello cash register here I come. These swimmers were mine! And so I found myself being challenged by all three kids to join them in the public swimming pool that week as they did lessons and lengths. I tried to suggest that maybe the swimmers weren't ready to be seen in public yet but I was outnumbered. I'd like to tell you I took to it like a duck to water but no, sadly my memories of swimming length after graceful length were about 25 years old and I looked more like a drowning wombat. Those swimmers are good, they just fall short of performing bloomin' miracles! Nobby's lighthouse was built in 1854 and is situated on a rocky outcrop off mainland of Newcastle. Since 1846 there has been a causeway constructed linking the lighthouse to the harbour. It's only in recent years that the public have been allowed to walk right up and into the lighthouse. It was a steep walk and I was regretting my foolish choice of footwear as I alternated between hopping and yelping as I braved the hot asphalt in bare feet! Despite my moaning we did make it to the top and the view was gorgeous. It's always fun to see familiar landmarks from a different viewpoint. I also had fun messing with the settings on my new camera. My favourite so far being the ability to balance the camera precariously on a chair and set the self timer for 10 shots. And so we got 10 photos of all five of us standing side by side. Some with tongues stuck out, arms in air and legs all a "can-can" style. Here's a respectable one I have permission to share with you. Oh the joy of teenagers who need so desperately to protect their reputations. I am taking full advantage of Gareth's youth meaning that I can publish photos willy-nilly without needing him to approve them all first! And finally, back to Nobby's beach to play "chase the seagull" and get an ice-cream to replace all those calories we had burned on our adventure! Yum! I've re-read last weeks entry and I'm sorry if it sounded so grim. The difference between last week and this is like the difference between winter and summer. This week was a breeze. I barely noticed I was fasting on Monday. No headaches, no grumbly tummy, barely a craving. Tuesday I felt a teeny bit hungrier but really not too much. And so on Wednesday I braved my local swimming pool this week for the first time in years. Gareth had swimming lessons and I decided to do a few lengths during his lesson time. Before his lesson began we shared a lane and did a few races. I didn't win any! I couldn't believe that my 10 year old Gareth was swimming the lengths faster than me and I was really trying to beat him. To summarise. I've now completed 5 weeks of fasting for 2 days and eating normally for 5. It doesn't feel like I'm on a diet once the two fast days are behind me. The weight loss is a bit variable. Last week I lost 1.1kg This week I lost just 0.1kg. I'm now comfortably exercising on 3 or 4 of the non fast days and don't have any problems with tiredness. I've still eaten chocolate and had an ice cream if we are out on the weekends. This week we had Valentines Day on the Thursday and I tucked in with gusto to the chocolates and nice Indian meal that we had that night. This probably explaines why I had such a small weight loss this week! The total weight loss over the 5 weeks is 2.4kgs which evens out at about 0.5kg per week. A healthy and recommended weight loss for long term success. Next week will throw a challenge into the mix. There is a long awaited "Girls Night Out" happening on an evening I should be fasting. I will need to decide whether to stay home (not bloomin' likely!) or whether to turn up but not eat (not very sociable) or change around the days I fast for (most likely scenario) It will interesting to see how I cope with a change to my routine. This would be the point at which I fall off the wagon on a regular diet. Once I have a big meal out I feel like I might as well throw the whole week out the window. Hopefully not this time! Wish me luck! Valentines gift with a difference! I've said before that I love Valentines day but not for the commercial-spend-loads-of-money-in-the-shops stuff. I love the things that take our time to show we care, not our wallets. This Valentines day I got an amazing present from Byron. It was "made" one night last week while I was at a school meeting. Rhiannon saw the idea on-line, Sian took hold of the camera and Byron was the willing participant. They tell me it took AGES to make and for that alone I feel loved! What to give a mum that loves photography? A photo of course. But not just any photo. Can you see the hidden message....?! I love Valentines Day. Not for the commercial side of things but for the chance to bring a bit of home made romance into normal day to day life. Each year a small parcel arrives and our kids are spoiled with cards and little treats from Granny + Grandad and Auntie Carrie in Dublin. This year Rhiannon saw a fun idea on Pinterest showing how to wrap a pack of Rolo's to look like a stick of dynamite. She asked me to put Rolo's on the shopping list but I kept "forgetting" when in actual fact I managed to find a similar shaped roll of Cadbury's chocolate and secretly make them up for the kids to give to them on the morning! I also made a cookie dough so I could make some heart shaped biscuits to bring to work and to share around some of the younger kids who live locally to us. I made a huge ball of dough and only used half of it and produced over 100 hearts! I stayed up till 11pm icing them and putting them in little bags and then left the house before 7am so I could place them on doorsteps on my way to work. The texts and photos that arrived on my phone over the morning as the hearts were found put a spring in my step and made me feel all warm and fuzzy! I contemplated doing a romantic meal on Thursday evening but Mr B has always said that Thursday night is Curry night. Valentines was not an exception in his head. So we set the table nice and opened some bubbles and even gave the kids sparkling water in champagne glasses and sat down to our Chicken Tikka, rice, Kashmir spinach, raita, poppadoms and heart shaped naan breads! Do you do anything special to celebrate Valentines day? Or do you think it's a load of rubbish! 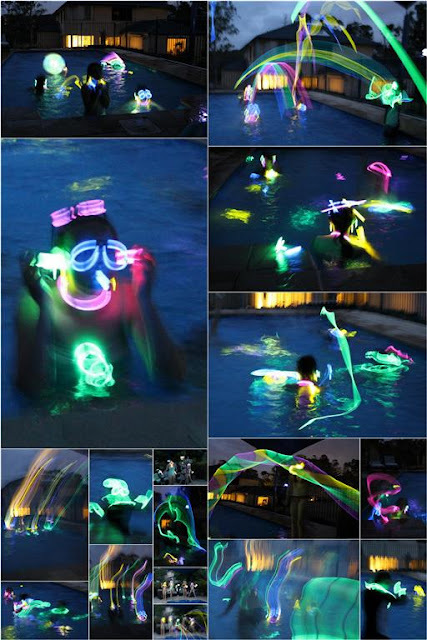 Over a year ago I read a fellow bloggers post where she let her kids have a night swim in the pool with glow-sticks. As soon as I read this I promised friends of ours that we would do the same. I'm embarrassed to admit that last summer whizzed by and the glow swim didn't happen. A new summer is whizzing by just as fast so when I saw a $10 box of glow products in a local store I text them demanding we set a date ASAP. The following night was suggested and despite a weather forecast of possible thunder storms it went ahead. We sat and watched the slowly darkening sky from the safety of the kitchen. The wind had picked up speed and it blew dark rain clouds across the sky. The grown-ups consulted iPhones and talked about leaving it to another night. The kids had no plans to chicken out. At last dusk descended and the brave kids ran out to the pool with various glow products while the parents followed nervously wrapped in blankets. We sat and watched as the kids threw the sticks into the water and shrieked and splashed and had the best time. The thunder rolled through the night sky and forks of lightning lit the distant skies. There was a good 30 minutes of fun before the storm crept closer and the rain started to fall. The kids admitted defeat and ran back inside the house carrying the glow sticks with them. Helped on by the couple of glasses of sparkling wine I had consumed earlier I thought it would be a great idea to copy yet another blogger and make glow jars. Out came the chopping board and scissors and I started to snip the ends off the sticks and drizzle them into empty jam jars. It was only when the kitchen lights were turned out that I realised the extent of the glow splashes all over the floor and counter tops. I sincerely do not suggest you follow my example if you have been consuming anything stronger than tap water. I ended up binning the chopping boards and investing in nice clean ones the following day! So there we have it. Another thing crossed off the bucket list! I think that was the best $10 we've spent in a long time! By far the worst week so far since I started this diet. All day Monday and Tuesday I was tired, grumpy and hungry. I drank tons of water. I even drank carbonated water because it's meant to make you feel fuller for longer. I don't know what made it so hard. Each morning I woke with a mild sore throat but not enough to make me feel I was sick. By lunchtime it had eased only to return each day. On Tuesday I got a coldsore. I've tried to work out what was so different. It was the first week where the kids were all back in school. Maybe being a little less busy made me dwell more on the fact that I was fasting? I tried to keep my hands busy. I emptied my pantry shelf by shelf, cleaning and rearranging as I went. I emptied and cleaned the fridge and freezer head to toe. I swear the food talked to me. I was like a woman possessed! In order to get my head in a better space I did what I do best and set to making a progress chart to hang inside my pantry door. There is a box for every day to write if I have either done a fast or some exercise. Any day that I do nothing will get an X in it. On Saturday I stood glumly on the scales and nearly fell off when I saw my biggest weight loss so far. My mood lifted and I felt better about everything. As I look back on the week I can see now that I was under the weather on Monday and Tuesday and probably shouldn't have fasted. My body was shouting at me but my head wouldn't listen. I was afraid that taking a week out would equate to giving up less than a month into a lifestyle I have promised to try to make long term. And so I look ahead to Week 5, coldsore mending and motivation charged up again and a lovely new chart awaiting words in each days space and not X's...! Teachers can be hugely influential on young kids. I'm sure you can think back to a teacher who inspired you as you grew up. For Gareth one teacher has been particularly wonderful. The amazing Mrs Woollett has inspired Gareth in many ways but particularly with her love of science. This teacher is always bursting with energy and ideas and her catch phrase is "...and THAT'S Science!" She taught Gareth's class one day last year and told them how to make ice cream. It involved a ziploc bag of milk and sugar nestled in a bigger ziploc bag full of ice cubes and salt. When all bags have the right ingredients safely inside you start to shake them madly and after a few minutes you have churned a small bag of home-made ice-cream. This week Gareth wanted to do this experiment again. I was tired and not feeling all that enthused but nothing could stop him until I gave him the go ahead. Unfortunately the outer bag exploded and sent ice cubes and salty water flying all over the kitchen tiles. I told him not to move and went straight for the camera so I could send Mrs Woollett a glimpse of the chaos in my kitchen all in the name of science. As I busied myself posting the photo onto Facebook with a sarcastic comment I heard the whoops of joy from the kitchen. The experiment hadn't been a total disaster and the inner bag was full of icy slush that Gareth proceeded to dish out to himself and his sisters. As he proudly carried the little dishes into the tv room to share I heard him say in a voice proud as punch... " now THAT'S Science!" Week 3 is over and I'm pleased to say that it went very smoothly. Having weighed myself every morning for the past three weeks I have seen a huge up, down, up, down on the scales. I think this is due to the big variation on food intake and the subsequent amount of food being processed within the body. Although I'd love to grasp the smallest number of the week I think it is most sensible to choose a day that reflects normality. I've decided to stick to Monday and Tuesdays as fast days and then weigh on a weekend morning when I've been back on normal intake for 4-5 days. I'm going to stay away from the scales on all the other days as it can get to being a bit obsessive and seems to dominate my thinking as I drag myself out of bed each day. So far in three weeks I have lost about 1.5kgs (about a pound a week) If I'm honest I think I was hoping for more. I think this is probably because advertisements for so many "loose weight quick" diets have filled my head with false expectations of more dramatic numbers. I know the healthy way is slow and steady but I'm also aware that the first few kgs come off the easiest and I just hope that the slow and steady continues and doesn't slow down too much. I talked about introducing exercise this week. I dusted down the exercise ball in the garage and found the DVD I had bought many months ago. It was still in its shrink-wrap so out it came and I put it on. All the curtains were shut and no-one else was home. I'd love to tell you it was great fun but it really wasn't pretty. As the beautifully toned instructor calmly led me through some basic balancing I was falling onto the floor left, right and centre. At one point she asked "are you feeling a little shaky yet?" Was I shaking? I was a red faced convulsing mess! When I truly could do no more I just gave up and lay there like a starfish on the cool tiles watching her complete the program and do her cool-down stretches with barely a bead of sweat to be be seen on her lightly glowing face. And so on Monday I will start my fourth week. If I can avoid the scales and complete at least one session of exercise right through to the credits I will feel very proud. I think Gareth is taking after his Uncle Joe the Accountant. He loves to save his money and set himself a goal of saving $100. As his collection of notes and coins grew he kept asking "When I have one hundred dollars can you bring me to the bank so I can swap it for a $100 note?" Finally the day came and he proudly queued with his fistful of savings and asked the teller if they had any green notes. They asked him how had he managed to save such a large sum of money? Was it his Birthday? They really made a fuss of him and made him feel very special. Lets hope this good habit leads to future prosperity! You won't forget your pool oul' mum when she's grey and hobbling along with a walking stick will you Gar? !